FREE Craftsman 12 Wrench Organizer! You are here: Home / Great Deals / Christmas Deals / FREE Craftsman 12 Wrench Organizer! 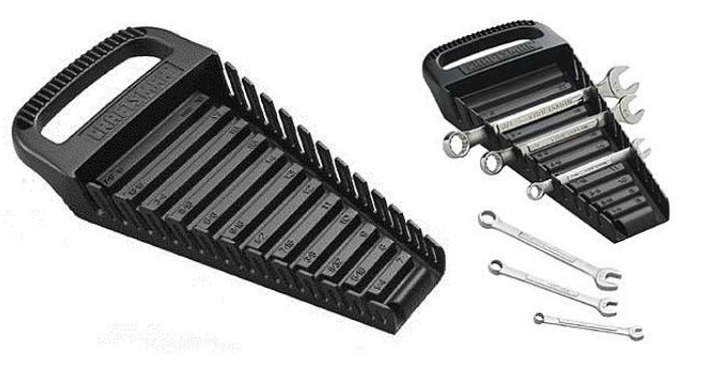 Sears has this Craftsman 12 Wrench Organizer on sale for $4.49 (Reg. $8) and you can get back $4.53 in Shop Your Way points, making it FREE! You can work much easier and faster by organizing your tools with the Craftsman wrench organizer with handle. This clever unit lets you keep up to 12 wrenches in one place. It fits wrenches of different sizes and organizes them accordingly to help you find the one you need. Grip handle makes it easy for you to travel with it comfortably to jobs and keep this portable organizer close so you always have your tools within your reach. Final: FREE PLUS FREE shipping on orders over $30 or FREE in-store pickup!